Apple is one of the tech giant, they are known for the unique style in technology. Macbook is the laptop brand of apple and it has got various transformation through out the year. Now let's have a look at the history of Apple's Macbook. Apple's first attempt at a portable battery powered computer was the Macintosh Portable. It was powered by a superfast 16MHz processor with 1MB of RAM. It had 4MB of ROM and weighed 7.2kgs. Wonder why it was called a portable and not a luggage bag. The PowerBook 100 was unveiled at the COMDEX computer expo in Las Vegas, on October 21, 1991 at an affordable $2300. It was still powered by the breathtakingly fast 16MHz processor, 2-8MB of Memory, 9-inch monochrome backlit LCD display with a resolution of 640x400. The iPad today is thousands of times more powerful than this machine. The PowerBook 100 was manufactured and designed by Sony (who would believe that) in collaboration with the Apple Industrial Design Group. It did not have a floppy disk drive but was popular for its compact design and a conveniently placed trackball pointing device (what we call a track-pad in our modern laptops). John Sculley, then CEO of Apple, who was famously brought on board by Apple founder Steve Jobs from Pepsi, personally oversaw the product development of the PowerBook 100. Between 1991 and 1994, Apple launched five variants of the PowerBook. The PowerBook 140 and 170 were designed entirely by Apple. The 140 was superior to the 100 in terms of design, specifications and boasted of a floppy disk drive. People actually preferred the 140 to the 100, as they didn't mind paying the extra cash for the floppy drive. Manufactured and sold by Apple, the PowerBook Duo was a line of small subnotebooks that were more compact than the PowerBook Line. Launched in 1992, the new range of devices was available till 1997 in seven different models, namely the Duo 210, 230, 250, 270c, 280, 280c, and 2300c. The PowerBook Duo was the lightest, weighing only 1.85kgs and also the slimmest PowerBook of its time. Even though the specifications were great, the device had a few drawbacks. The Duo used 88% of the standard keyboard that made it difficult to type on. Likewise, the size of the trackball too was reduced adding to the inconvenience. The PowerBook 500 Series codenamed Blackbird marked a significant milestone in Apple's notebook line up. For the first time the trackball was replaced with a track-pad. The first in the PowerBook 500 series was launched on May 16, 1994. It brought an array of new features to the portable computing market. Apart from the track-pad, the device also possessed 16bit stereo sound @ 44.1kHz where as the industry standard was 8bit mono @ 22kHz. It was also powered by “Intelligent” NiMH batteries that had on-board circuitry to monitor their health. The PowerBook 540c is rated number two of the all-time best PowerBook models made according to Insanely Great Macintosh (survey taken Nov, 2000). The PowerBook 5300 & 190 were launched in 1995 and discontinued in 1996. The PowerBook 5300 was met with criticism such as battery fires and choice of internal hardware. The 190 on the other hand was a no nonsense notebook aimed at the college student. It wasn't well received in the market and discontinued within a year of its launch. The PowerBook 1400 was launched in 1996 for a price of $2499 and stayed in circulation till 1998. After the launch of the PowerBook 3400, the 1400 was considered as an entry level Apple notebook. In its 18-month lifecycle, it was available in a number of specifications. The processing power ranged from 133MHz, 117MHz and 166MHz. It had an 11.3" colour display with 800x600 resolution. The PowerBook 1400 was credited for being the first notebook computer to come available with a built-in 6x optical drive. Launched in November of 1997, the PowerBook 3400c was considered as one of the swiftest laptops in the world. The notebook ran at the speed of 240MHz and was the first to feature PCI (Peripheral Component Interconnect) architecture, EDOmemory (commonly known as Dynamic Random Access Memory) and a 64-bit 40MHz internal bus. The PowerBook G3 was launched in 1997 and discontinued in 2001. The various iterations of the PowerBook G3 were code named "Kanga", "Mainstreet", "Wallstreet", "PDQ","101", "Lombard" and "Pismo". The final model Pismo boasted of some interesting specs such as 24-bit 1024×768, 14.1" TFT (Thin film transistor) display, PowerPC 750 "G3", 400/500 MHz processor, 6–18 GB HDD, 6× DVD-ROM, 64or 128 MB RAM and Mac OS X 10.4.11 "Tiger". Not to be mistaken for the desktop, the iBook was a series of Apple's notebooks sold between 1996 and 2006. The iBooks were mainly targeted at the educational market and didn't boast of any exceptional specs. They did however have cool design and came in a variety of colours like "Tangerine", "Blueberry", "Graphite", "Indigo" and "Key Lime". Launched in 2003 and discontinued in 2006, the PowerBook G4 was the last of the PowerBook Series before being replaced by the MacBook Pro line-up. Apart from being one of the most powerful notebooks available in the market, the PowerBook G4 faced some quality issues. The hinges of the Titanium notebooks were notorious for breaking under typical use. Apple however addressed this issue by changing the design slightly to improve the strength of the hinges. In 2006, towards the end of the PowerBooks life, Titanium body was replaced with Aluminum. Launched originally in 2006 and still active, the MacBook Pros have undergone some major changes. The original MacBook Pros had the slot based CD drive in the front panel that was shifted to the right panel when the series was revamped in 2008. The 13-inch MacBook Pro was introduced in 2009 prior to which the Pros were available in 15 and 17 inch only. 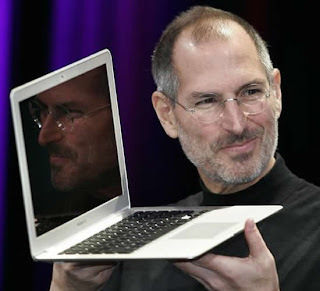 The latest iterations of the MacBook Pros were showcased on February 24, 2011 (Steve Jobs' birthday). Apart from the processing capabilities and improved graphics cards, the device also boasts of Thunderbolt, a new serial bus that can allow data transfers of up to 10Gbps. Launched in 2006, the MacBook is considered as Apple's entry-level portable computing device. The MacBook is primarily targeted at the educational market. According to the NPD (National Purchase Diary) report October 2008, the MacBook is the bestselling Macintosh in History. MacBook Air Apple's ultraportable laptop, the MacBook Air is prompted as the world's thinnest notebook. Available in 2 variants, 13.3-inch and 11.6-inch the devices boast of SSD Flash storage and a battery life of up to 7 hours. The MacBook Airs are thin enough to fit in a manila envelope. 3D Masks by a Japanese company - " REAL-f "